Somehow, my timing really worked out. I finished my 6-week Zentangle drawing journey only a few days ago and what should arrive but my latest review package from Beauty BigBang. I was excited to play with all the new shinnies so today we’re looking at a lovely 12-grid mermaid sequin set (J9735). And since it has so many different shapes, I’m planning on at least one more review look for these. So if there’s a particular shape you want to see me use, now’s the time to speak up! So in the end you have 24 different shapes to choose from. That’s pretty amazing. Now the shapes are not always going to be perfect for every single sequin. 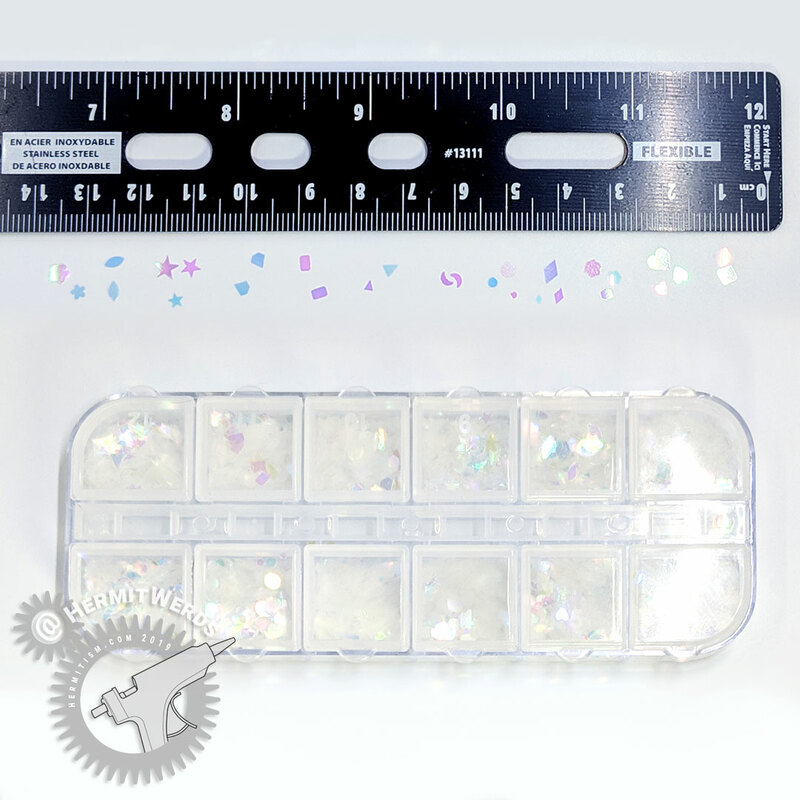 I have purchased about 8 or 9 different for-nail art glitter/sequin products before and they all have some bad cuts. It’s more about the ratio of good to unusable pieces and I’d say the set I have has a great ratio. I didn’t run across any bad cuts as I was fishing around for the sequins I used in the photo above. Beauty BigBang describes the finish on these as mermaid and that’s pretty apt: there’s a lot of pinks, blue, purples, and yellows. I was not able to include the yellow sequins in the product photo because they wouldn’t show up against the white background, but they are there. Finally, the thickness of each piece is pretty middling. They aren’t going to stick out a lot, but they aren’t going to bend around your nail either. 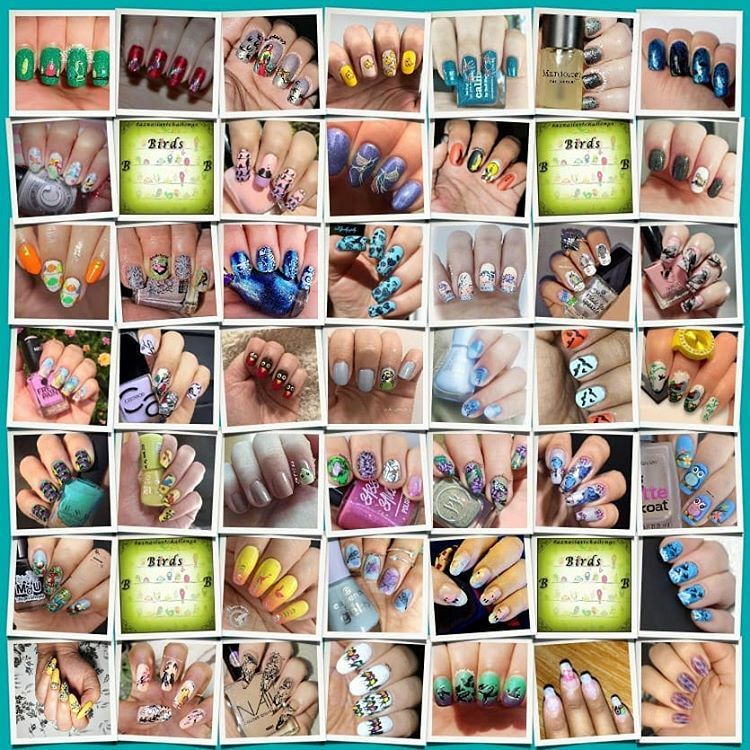 For those with nails that are both narrow and curvy, you’ll probably have to give up on using the largest shapes, but the small pieces are small enough that anyone can use them. That’s right! Kid friendly! Normally I put one bit of glitter down at a time and try to keep from displacing the others as I do so. 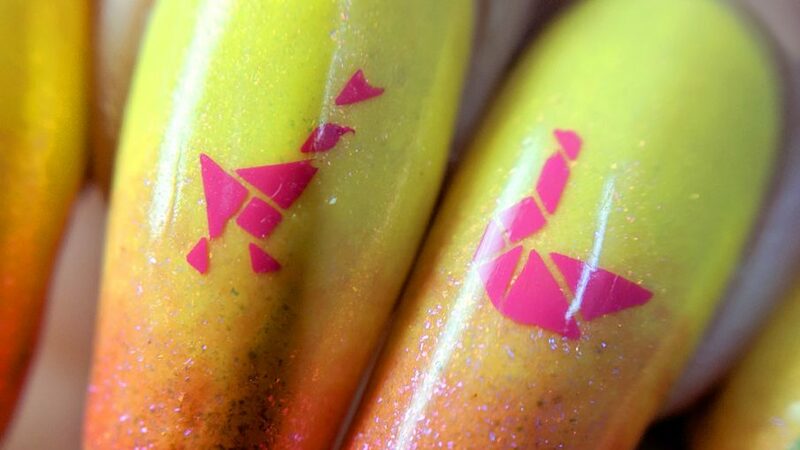 This time I tried something different and lined things up on a clear stamper before applying them to my nail in one go. It was still a little difficult because if a sequin stuck to the stamper in the wrong position it wasn’t easy to shift it. I think next time I’d like to try using a strip of striping tape to help line things up super straight and using a clear stamper that is less “sticky”. 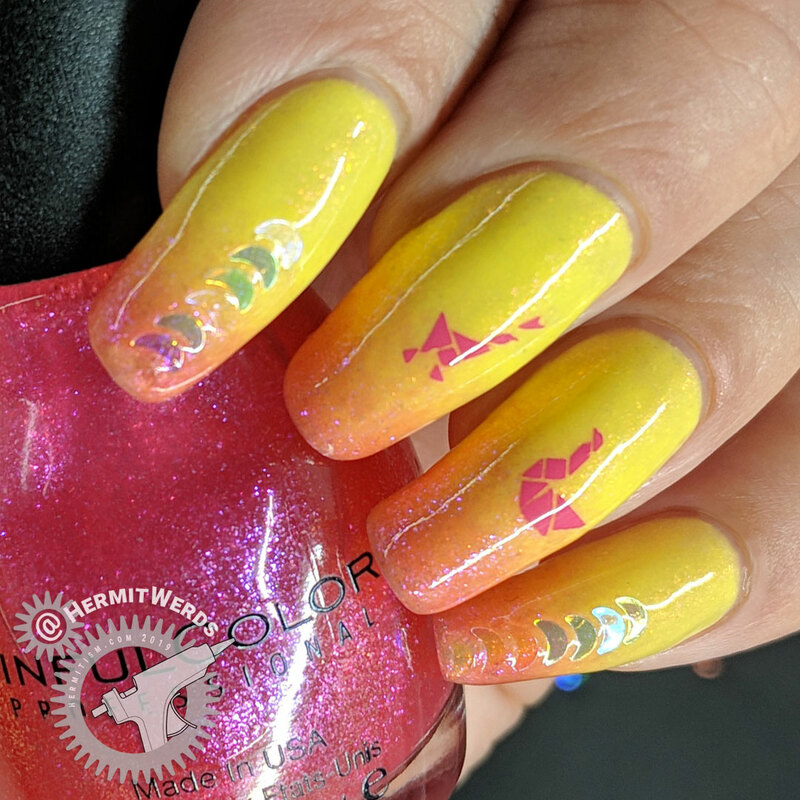 I love how this nail art came together. 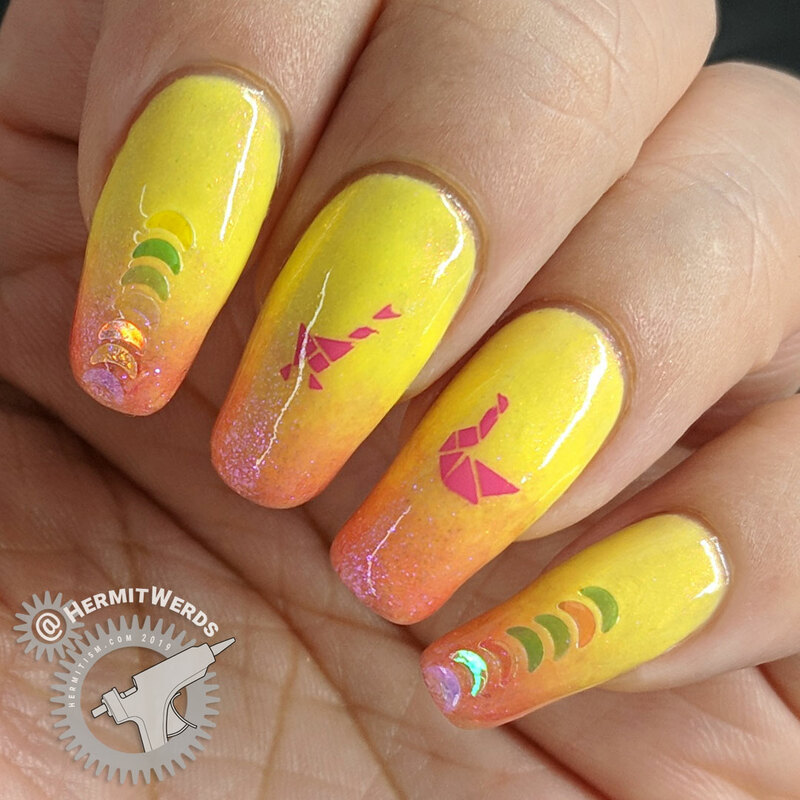 I’ve seen a yellow/pink thermal polish before and I wanted it pretty badly, but I had a feeling that I could imitate the look without buying the polish and I was right. 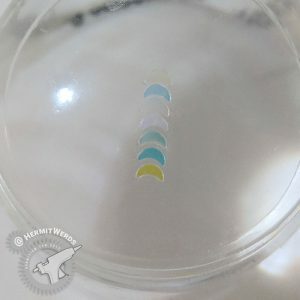 Sure, it doesn’t have the color-changing ability, but thermal polishes often lose this property over time. So it’s not the biggest loss out there. However, this did take a long time to dry. 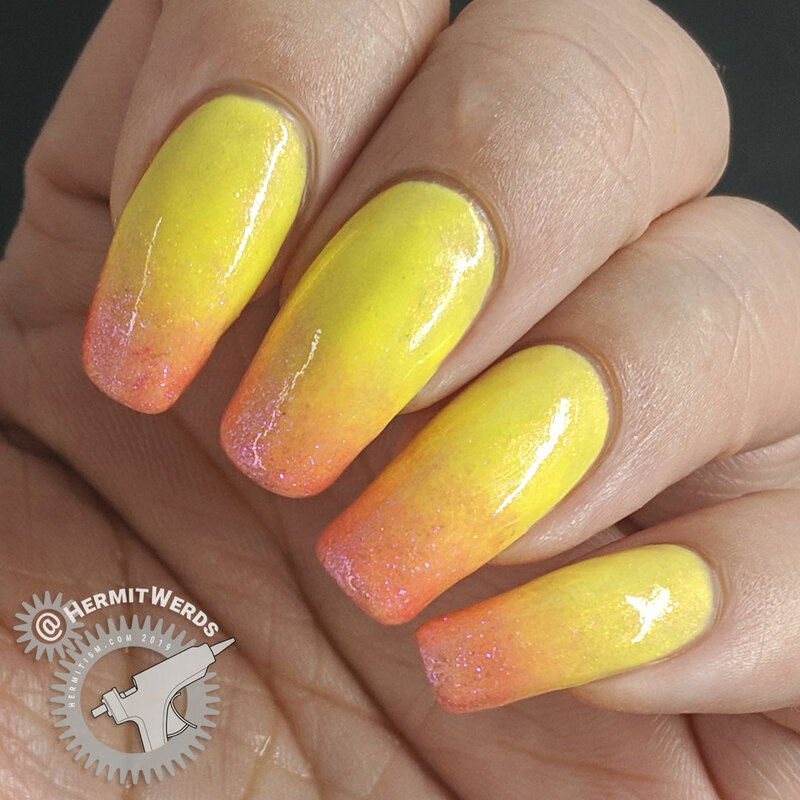 ORLY’s “In Summer” is a typical yellow in that it took three coats for opacity and the third coat was very thick. Now “In Summer” already has a slight pink shimmer in it, but I wanted even more pink. So I sponged on three layers of gradient with Sinful Colors’ “Zest of Times“. I’m both surprised and delighted with how much use I’m getting out of this polish now.